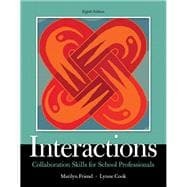 Interactions gives readers an authoritative look at the essential skills necessary for working effectively with others toward quality education for all students through cooperation and collaboration. Comprehensive and well written, it presents an ideal blend of theory and practical applications and is designed to help those in special education, the related services, and other disciplines work with colleagues, administrators, professionals in agencies outside schools, and parents and families. Following a helpful overview of collaboration in contemporary schools and across society, the authors introduce essential communication skills that form the foundation for successful collaboration; show a focus on problem solving and its common collaborative applications; and look at such critical topics as teaming, the key principles of co-teaching, consulting, coaching, mentoring, and conflict and resistance. Every chapter features numerous opportunities to learn new material and reinforce what’s been learned, including the addition of links within the text that make this edition a highly interactive learning tool. The Enhanced Pearson eText features embedded videos and assessments. Dr. Friend has consulted with school professionals nationally and internationally (more than 3000 presentations and projects in the United States, Canada, Europe, the Middle East, and Asia) as they collaborate to educate their students, assisting them to create classroom partnerships through co-teaching, to form productive and efficient work teams, and to foster inclusive practices. She is the author or co-author of three widely used college textbooks on special education; a variety of co-teaching materials for teachers and administrators; more than 50 articles about collaboration, inclusive practices, and co-teaching; and a highly popular video series on co-teaching and other inclusive practices. Lynne Cook, Ph.D., was professor and former dean of the College of Education at California State University Dominguez Hills. She began her career as a special educator working with students with emotional disabilities and intellectual disabilities, earned her doctoral degree from University of Michigan and held faculty positions at University of California, Los Angeles and California State University, Northridge. She served as the President of the Teacher Education Division of the Council for Exceptional Children, and she also worked extensively at the federal and state (CA) level to help shape policy related to the preparation of special education teachers. She was also Director of the National Clearinghouse for Special Education Professions, and she worked in Washington, DC as the expert in matters related to disabilities for Sen. Tom Harkin. Dr. Cook consulted nationally and internationally, most recently work with educators in Italy to foster effective special education teacher education. She wrote and conducted research in the areas of teacher retention and career paths, professional collaboration, co-teaching, and inclusive practices. Dr. Cook passed away in July, 2015.